The comic-est anthology of 2018! Comedians love comic books, cartoonists love comedy, and our idiot editor used to mix up comics who tell jokes and comics that have pictures. 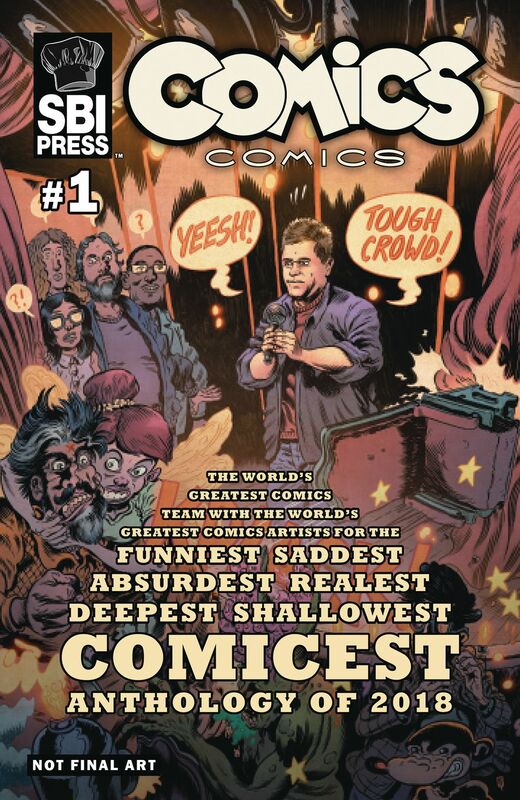 Now his perpetual confusion has led to the creation of Comics Comics, a quarterly anthology teaming comedy’s best with funny books’ brightest! Headlined by Patton Oswalt (MST3K, Happy! ), issue #1 features hilarious original stories from comedians Jackie Kashian (The Dork Forest), Sara Benincasa (Getting Wet with Sara Benincasa), Eliot Rahal (New Comic Book Day), and Rose Matafeo (Funny Girls), with art by Troy Nixey (Vinegar Teeth), Robert Hack (Chilling Adventure of Sabrina), Carolyn Main (Pitch, Please! ), and more!